Prince William Sound, Alaska, Culross Passage. Fourteen nautical miles east of Whittier. Water depth is 150 feet with a rock and mud bottom. I’m running a 212-foot converted offshore supply boat under contract to Exxon for the second year of the Exxon Valdez spill cleanup effort. The passage is approximately half a mile wide with the wind out of the east at 30 knots, gusting to 50. I have out 500 feet of chain. The engines are on immediate standby in case the winds get worse and we start to drag. Scope is the ratio of anchor chain or line that is paid out compared to the water depth below the vessel. The rule of thumb is that you start with three to five feet of chain and line per foot of water depth. Wind and current play a very important part in how much scope you use as well. If it is calm with little current, you may get away with a scope of three to four. The more wind and/or the more current, the more scope you will need to use. It is not as much about the anchor, but how the chain lies on the bottom that is the key. The chain needs to lie flat on the bottom and pull the anchor horizontally to hold effectively. With both wind and current pushing on the boat, the more scope or chain you have out, the more chain there is lying flat on the bottom and pulling horizontally on the anchor. The horizontal pull allows the anchor’s flukes to dig into the bottom. Location, location, location is the other major factor in anchoring successfully. Before you arrive to the area where you intend to anchor, a study of the chart should be made. Water depth is extremely important for many reasons. You want enough depth to adequately account for any tide range, but it should also be shallow enough to make the best use of the amount of chain you have. Most boats will carry a standard 300 feet of chain. If you anchor in 50 feet of water and need a five to one scope, you use most of the chain that is available. The more chain you use, the bigger your swing circle will be as well. For those of you who have a few feet of chain and mostly line, a considerable amount of extra scope will be needed. Remember that your line weighs almost nothing in the water and will not lie on the bottom. Extra length or scope will be needed to compensate. When you arrive at the area in which you wish to anchor, the location of other anchored vessels must be carefully noted. They will all tend downwind and down current. You must always ask yourself, “how will my vessel move on anchor relative to these other vessels if the wind or current changes?” Anchoring too close to other vessels and not taking into account the way they will swing given the wind and current is a common mistake. The trick of eyeballing the right spot with other anchored vessels comes with practice and a few close calls. Safely picking the anchor back up is just as important as putting it down. I recommend a two-person operation in which one operates and spots the chain and the other maneuvers. Place the vessel bow into the wind or current with the chain tending forward. Ideally you want the chain to tend down and forward to start pulling. Move up on the chain as you bring it up. The person operating the anchor windlass will spot and convey the location of the chain and anchor to you. This is called the Med Moor, named after the style of moorage used in the Mediterranean where dock space is limited. The Med Moor requires precision placement of the anchor followed by a backing down to put the stern just feet from the dock you are tying to while deploying the right amount of scope to properly hold the anchor. Over the years, I have had to Med Moor large motor yachts seven times in the Caribbean, Central and South America, and Mexico. It was very windy each time. Properly placing the anchor far enough out, upwind and/or up current, is key to success. At least half of my attempts have had to be redone one or more times, including the one I just described. Knowing just how much chain you have out is crucial to any anchoring operation. Some boats have counters that tell you how much you have let out, but I feel the best and most reliable way is to mark your chain. There are many different ways to mark your chain, but the one I like the most, and the easiest for me to remember, is to mark it with paint. I will use bands of red, white, and blue, then red-red, white-white, and blue-blue, and so forth. Each mark represents 25 feet until the end. Whatever method you use, make it something you can remember. I also highly recommend exercising your equipment on a regular basis to make certain it is operating properly. Run the windlass down and up, and loosen and tighten the brake. I have had occasions where the brake was worn and would start to slip while pulling in the anchor chain. Select a suitable position based on water depth. Make note of the tide range and allow plenty of room for you and your neighboring vessels to swing. Calculate how much chain or scope you may need given the winds and currents. You can get away with three to four feet of scope in calm conditions, but it’s best to err to five (or more) when the wind is up and the current is pulling. Prepare your anchor for dropping, ideally with two people (one to operate the anchor and one to maneuver the boat). Ensure that the equipment is operating properly and the brake is set. I recommend lowering it using the motor. Approach your intended position bow into the wind and current. When the anchor is down, you want the boat to drift away from the anchor chain. When you are at your intended position, make sure the boat is dead in the water then drop the anchor. Continue to pay out anchor chain until you reach your initial desired scope. Allow the boat to drift back on the chain and settle. I put the boat in reverse for a few seconds and back down on the chain. If you are properly anchored, the weight of the chain will pull the boat forward and will tend downward from the boat. Pick different reference points on the beach to monitor your position to ensure that you do not drift. 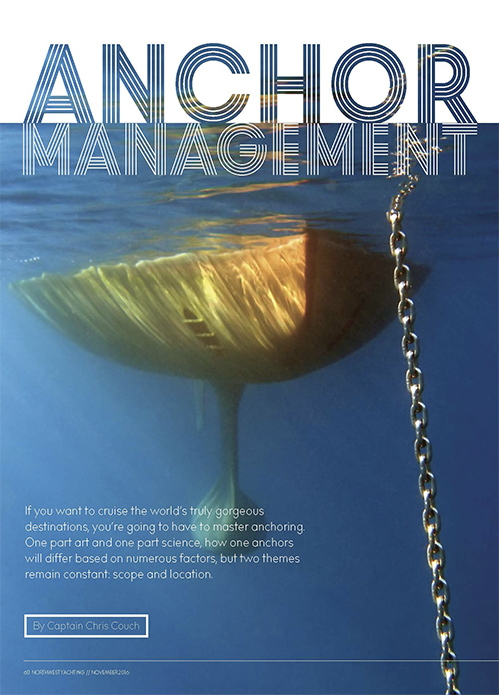 Location and scope are the two fundamental components of any successful anchoring scenario. Plan ahead, think ahead, and enjoy the water. Captain Chris Couch is a successful Pacific Northwest-based delivery captain who has been widely used by companies like Alexander Marine and Emerald Pacific for the last 26 years. Couch enjoyed a 14-year career in the US Coast Guard that took him around the country to the East Coast, Gulf, and West Coast on all kinds of vessels. He has been at the helm through the Panama Canal five times and for four transpacific crossings. His book The Checklist is enjoyed by and distributed to yachts owners and is a fantastic resource that covers just about everything Pacific Northwest. You can buy The Checklist, check out his other publications, or contact him at compassheadings.com.